This project is to enable activist teams who will visit local jurisdictions around the San Onofre nuclear plant and ask them to support the "Move the Waste" settlement agreement and the HELMS proposal, which requires a 1,000 year design life instead of only 40 years for spent nuclear fuel storage. HELMS_Flier.pdf: 4-up HELMS hand out -- Print and cut into four. Best to use color printer but B&W will work ok.
HELMS POSTER.pdf: HELMS Poster (color PDF). This is the simple vertical HELMS poster. Proposed Resolution Supporting 'Move the Waste' settlement and HELMS (PDF) -- Print one for each member and one for clerk. Settlement_Fact_Sheet.pdf: "Move the Waste" Settlement Fact Sheet -- Print and hand out one for each member and one for clerk. The public support petition is very important as we file in front of the NRC, the DOE and other regulatory agencies, to show that we are backed by the public. The paper petition can be filled out at any meeting and then mailed in so we can submit them at the proper time. On-Line petition is a bit easier for us to extract the names. 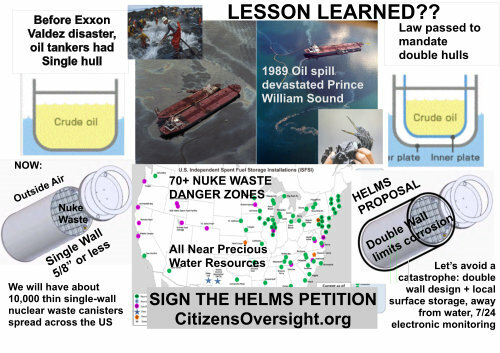 Helms Petition -- Visit this page to sign the on-line petition! HELMS Paper Petition (PDF): HELMS paper petition - Print out and gather signatures at the meetings, then mail in (or scan and email to us). Helms Proposal -- We have submitted a formal legal action with the NRC and we are now awaiting a hearing. Our claim is that the NRC must upgrade their canister requirements so they will last 1,000 years instead of only 40. We propose a dual-wall cask system with 7/24 monitoring, located away from precious bodies of water and dense population areas. This only makes sense! Teams of volunteers will visit city councils and other jurisdictions (Counties, etc). Best to email everything in advance. Usually, you can send one set to the clerk and they will distribute to the council. If you really want to get this to happen, you need to work with a council member and get it on the agenda. They can't take any action from public comment except to perhaps schedule it at a later time. Print (Letter, Proposed Resolution, Move the Waste Fact Sheet) and give set to each member of the council and one set for the clerk. Sign up to speak at public comment. If you can, take pictures and video record or find out where the video is that is prepared by the jurisdiction. Gather signatures from the audience using the paper petitions. Then mail these to our office. Share your experience so we can refine our campaign! We have established a database of elected officials and jurisdictions suitable for planning and tracking. This database is available to those who have volunteered to help implement this campaign, after we have enabled access. Please contact Ray Lutz to coordinate with the rest of the team. We have found that having people read prepared statements is not very effective. It is best to USE YOUR OWN WORDS and to make it PERSONAL. Nevertheless, I provide the following as a starter. Mayor and City Council members, My Name is _____________ and I come before you today to speak about one of the most troubling "ticking time bombs" in our region. I am speaking about the Nuclear waste at the San Onofre Nuclear plant. The current plan is to bury the waste in thin steel canisters -- only 5/8" thick, only about 100 ft from the seawall and literally inches over the high-water mark. These canisters have a design life of only 40 years, and they did not take into account the salt air of the ocean. Meanwhile, the spent fuel will be toxic for some 250,000 years. Each canister has 37 fuel assemblies in it. Stand next to one of these assemblies for 3 minutes and you'll die. That's how toxic it is. We believe this site is the wrong place to store such toxic materials, and the manner in which it is stored far from adequate. The question is not IF these will become a problem but WHEN. Therefore, I am coming before you today to ask for your support on two worthy initiatives. First, we ask you to support the recent settlement agreement to Move the Waste to a safer place. I have provided a brief overview of that settlement agreement, and with your attention on this, we can make sure they follow through. Secondly, I am asking for your support of a legal petition placed before the NRC to require containers that have a design life of 1,000 years rather than only 40. 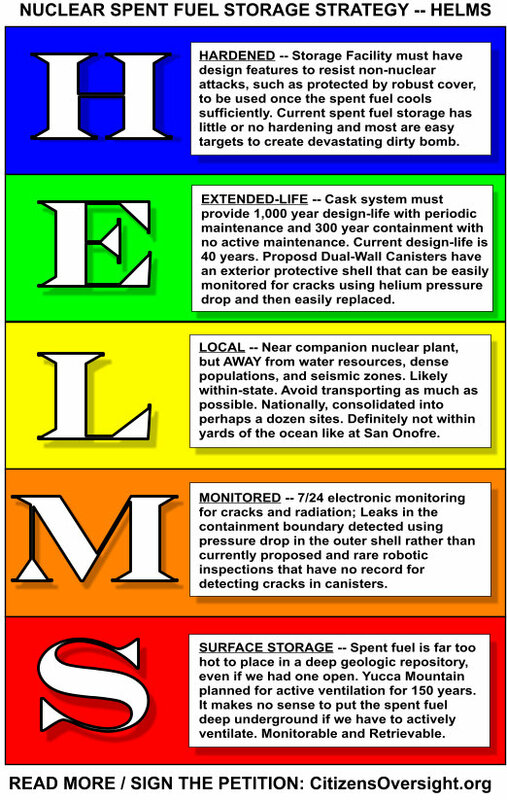 The HELMS proposal requires that they use Hardened, Extended Life, Local, Monitored, Surface storage. The proposed resolution will help use move these initiatives forward and I ask you to consider adopting the resolution by this body.